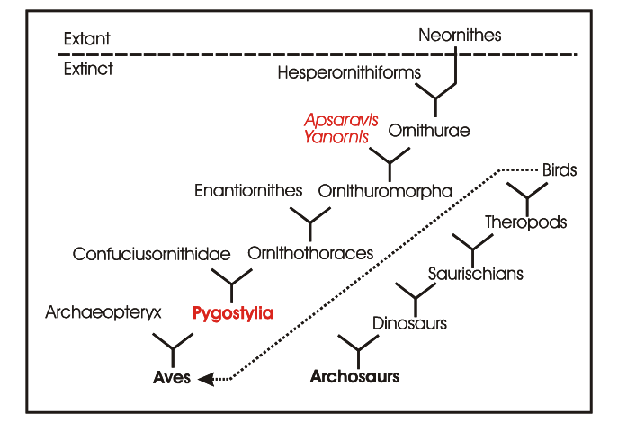 The early evolution of birds involves a step where the long tail of theropod dinosaurs is reduced and forms a pygostyle at the end: Pygostylia in the cladogram of Fig. 1. In extant birds the pygostyle bears the tail feathers (rectrices). Whereas the tail of biped theropods could help to keep balance, tail feathers of birds serve flight manœuvres. 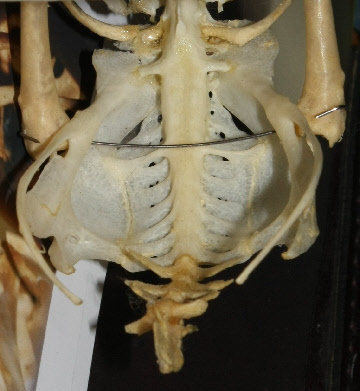 During evolution the reduction of the tail is accompanied by a melting of lumbosacral vertebrae named „synsacrum“. In modern birds this synsacrum houses specializations which seem to function as a sense organ of equilibrium (see Sensory systems; Necker 2006). I am interested in the question whether avian predecessors with a pygostyle and a synsacrum do have these specializations. 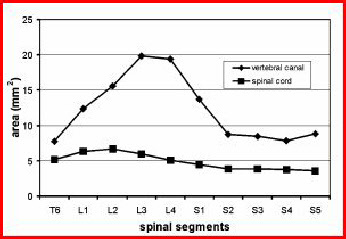 In the lumbosacral region there is a widening of the vertebral canal (arrows in Fig. 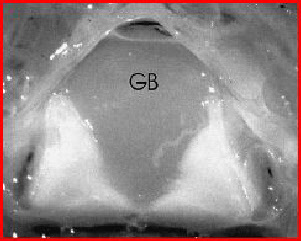 2) which is due to a massive glycogen body which fills a groove between the separated halves of the spinal cord (Fig. 4). This widening is not due to the lumbosacral enlargement of the spinal cord as can be seen from Fig. 5 but to the appearance of the glycogen body. The extinct bird Apsaravis (see Fig. 1 for phylogenetic relationship) shows a similar widening (Fig. 3) which points to the presence of a glycogen body. 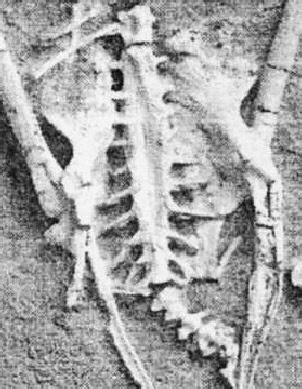 A similar but less clear synsacrum may be present in Yanornis martini (see Fig. 1 for phylogenetic relationship). Enormous enlargements of the vertebral canal of sacral vertebrae (also named „sacral brain“) have been observed in the ornithischian genus Stegosaurus (Marsh 1881) and in sauropod saurischians like Dicraeosaurus and Barosaurus (Janensch 1939). 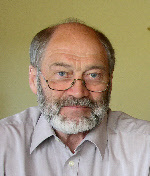 Giffin (1990, 1991; now Buchholtz) showed convincingly that these enlargements cannot be due to an enlarged spinal cord but may be due to a bird-like glycogen body. There are, however, differences to the lumbosacral region of birds: in Stegosaurus the enlargements confine to two sacral vertebrae and in the sauropods in each segment an intravertebral transverse wall leaves a much smaller opening for the spinal cord compared to the intervertebral cavities (Fig. 6), i.e. the spinal cord cannot be as large as the largest width of the cavity. The function of the glycogen body, which is unique to birds, remains enigmatic. Despite its high glycogen content it does not function as an energy reserve. There is some evidence that it is metabolically active and enzyme distribution suggests a contribution to the lipid metabolism, e.g. 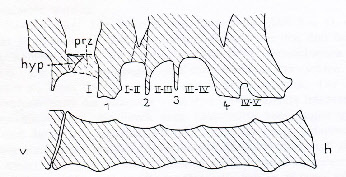 myelin formation of the CNS (DeGennaro 1982). It has recently been shown that because of a normal blood-brain barrier the products of the glycogen body should be distributed via the cerebrospinal fluid (Möller and Kummer 2003). However, the question arises why the lumbosacral region should need excessive lipids. The sacral enlargements of non-avian dinosaurs do not share much structural similarities with the lumbosacral specializations of modern birds. Furthermore these species were quadrupedal and had a long tail, i.e. there was no need for a sense organ of equilibrium. 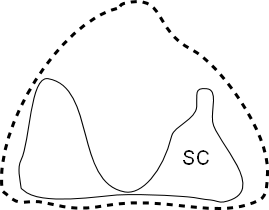 It seems that early birds with a pygostyle and a well-developped synsacrum show structural specializations which resemble that of modern birds. However, there is a need for more details and more examples of well-preserved fossils. Fig. 6: Midsaggittal section through the sacral vertebral column of Dicraeosaurus. From Janensch 1939.